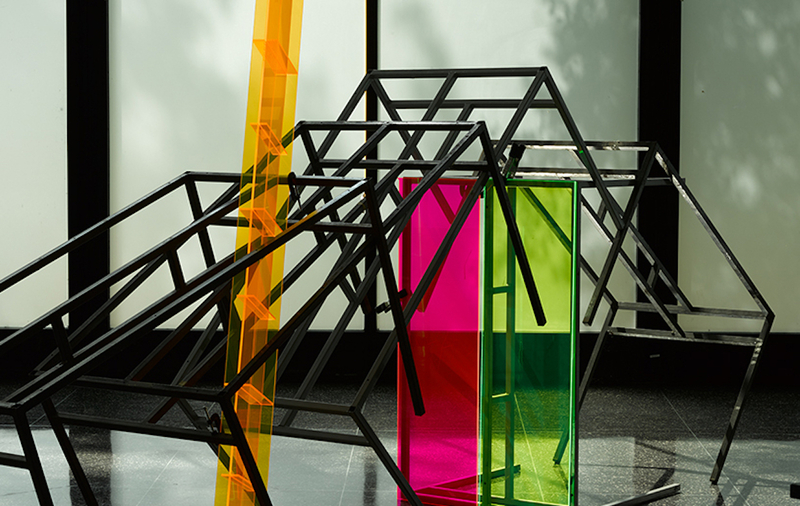 Barbara Kasten has designed the set for a five-hour “marathon” of interviews during Expo Chicago. Barbara Kasten is tough to categorize. She began her career as a painter, but soon switched to making vividly colored abstract photographs. She creates them by arranging mirrors, glass, and other materials into atmospheric assemblages, in a process that resembles sculpture or installation work. On the wall, the work hits with the visual punch of hard-edged abstract painting, but it has the depth of architectural photography, playing with the perception of light and space to conjure surreal cityscapes or oddly angular interiors. Kasten’s refusal to sit quietly in one discipline makes her well suited to design a set for Creative Chicago: An Interview Marathon, a five-hour succession of conversations conducted by Serpentine Gallery director Hans Ulrich Obrist with a category defying roster of participants. The program, which is presented by the Chicago Humanities Festival, will take place on Sept. 29 at Expo Chicago, the annual art fair on the city’s Navy Pier, which runs Sept. 27–30. Obrist asked Kasten to design a backdrop for his back-to-back interviews with noteworthy Chicago residents, from artist Amanda Williams and architect Jeanne Gang, to Obama Presidential Center Museum director Louise Bernard and Buritt Bulloch, to the impresario behind Chicago’s Old Fashioned Donuts. Kasten obliged by creating a variation on an installation she recently produced at Crown Hall, the Mies van der Rohe–designed architecture school building at the Illinois Institute of Technology. The set will frame Obrist’s conversations, and then its components will live on as individual artworks. The whole project is part of Art Design Chicago, a year-round series of cultural programming underwritten by Chicago’s Terra Foundation for American Art. 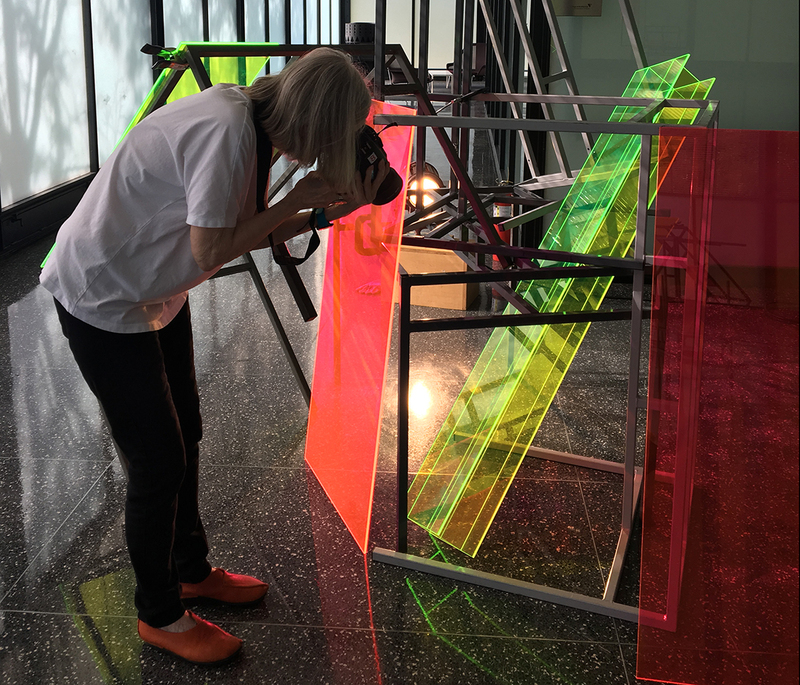 In advance of the presentation, Surface spoke with Kasten about the work, its celebration of blending creative disciplines, and her favorite type of neon plexiglass. What did you think when you were asked to design a set for five hours of interviews? The staging itself was an extension of a project I just completed at Crown Hall and IIT. I used Crown Hall as my studio for six weeks in the same manner as the students who occupy it during the school year. They work on tables and I like the interdisciplinary exchange that [that] promoted. They mixed sculpture with woodworking, they made stage design, they made film, and there was no hierarchy. There was this mixture and experimentation with materials. So I conceived of taking these works and repurposing them for the stage set. The focus is on Moholy-Nagy and Mies van der Rohe who were both associated with IIT and the Bauhaus. They were artists and educators and both became part of the rich web of Chicago’s art and design history, so it seemed like a really appropriate direction for the Art Design Chicago program. How does that relate to your process in general? Do you start by experimenting with material or with a clear idea of the final work? I mostly start with the material and a reaction to what it can do. I’m working with a fluorescent plexiglass for the [Creative Chicago] set and it has a light quality that transmits to the edges, so you get very distinct lines of color. 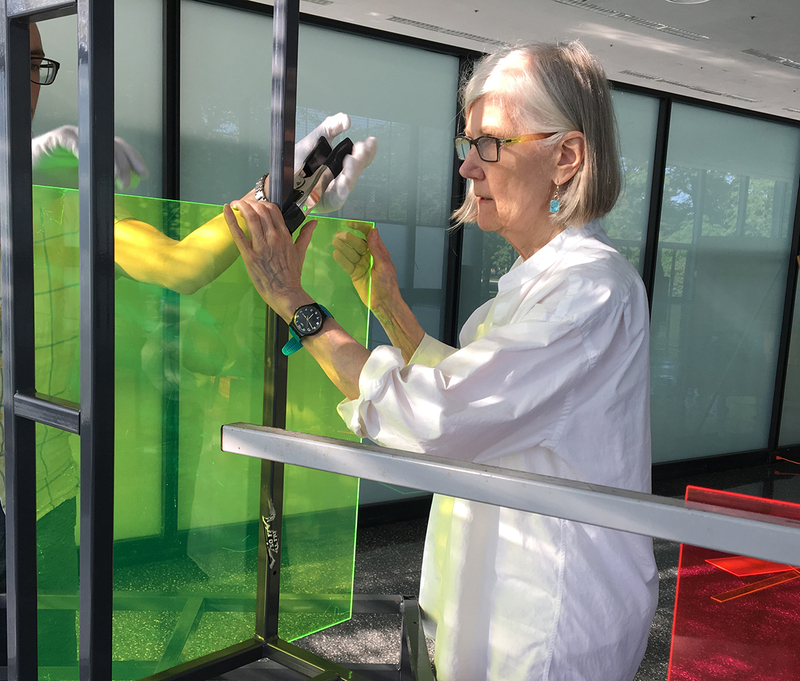 With the sculptures at Crown Hall, I started with already existing objects—the tables—and then from there it was a matter of experimentation and finding interesting forms. It’s a lot of observation of what the material does and how you perceive it differently through a camera lens [versus] how you perceive it in reality, in real visual perception on a one-to-one basis. It’s the comparison of those two things that interests me, so I’m really depending on the material to tell me what’s interesting about itself, and that’s where I start. It’s interesting that you came to photography of installations. Right, and I didn’t want to abandon painting. I don’t know if I actually have. I think a lot of what I do is based in concepts that come from painting techniques and goals and vision. It’s just that I’m now translating some of these same concerns in a different medium, and at this point, I’m translating those again to another medium. Although all along the way, they’ve all been interchanged. So I guess I’m a mixed up artist [laughs]. And how do you see your work in relation to architecture? Architecture has structure and form and everything that I like to do has structure, form, and a rationale. None of the works of sculpture that I’ve done so far have elements that are attached to one another. They’re all precariously balanced on each other. That’s also an interesting aspect of architecture, where cantilevers look as if they’re ready to fall, but they’re balanced by the rest of the structure. I like that kind of challenge, and misperception of what’s going on. So what will the set for Creative Chicago: An Interview Marathon look like? I’m using the tables from Crown Hall and I constructed beams from this fluorescent plexiglass, so I have a version of the signature Mies girder that holds Crown Hall together. How will the stage comment on the conversation? Given today’s political climate, I wanted to emphasize how Mies and Moholy-Nagy were European immigrants and they fled—well, they were invited—to Chicago to do the work they were already known for. But, they were both at the Bauhaus and it seemed like coming to Chicago at the behest of Chicago was a very important step in the development of the culture and the art scene here in [the city], and in the world really. So that’s generally how I approached the whole set. I think it reflects the immigrant population of Chicago, as well as the country and how they have contributed to the culture, design, and art aspects of a major city.